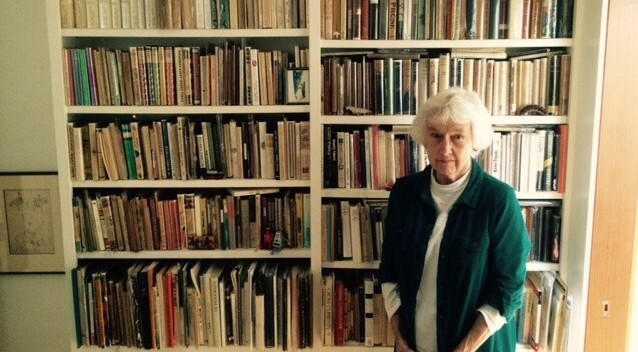 Norma Comrada in her library. The Oregon Center for Translation Studies, supported by the UO Global Studies Institute, draws together a diverse group of faculty, graduate students, and active professional community members and emeriti who work across languages and disciplines in the area of Translation Studies. We pursue research, teaching, and practice related to multiple forms of translation. As a group we are committed to exploring interdisciplinary aspects of these endeavors. The Graduate Specialization in Translation Studies aims to strengthen and enrich opportunities for UO students by drawing on existing offerings across disciplines and, where possible, adding to the current curriculum, in Languages, Literatures, Anthropology, International Studies, and Folklore at UO. In this way, the Specialization contributes to strengthening graduate offerings in this vital and complex field. The Specialization took effect in September 2015. **For upcoming events, please click on the News & Events link above. ** Please contact the TS Graduate Specialization Co-coordinators Amalia Gladhart (gladhart@uoregon.edu) or Susan Anderson (susana@uoregon.edu) for more information.